Some of the amino acid residues building a protein can be in different protonation states and therefore differently charged states. 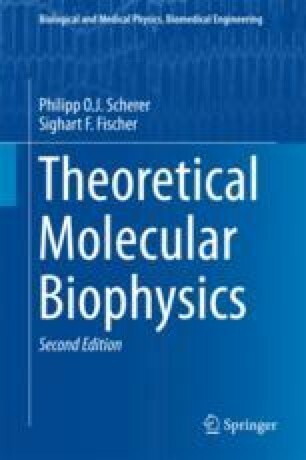 In this chapter, we discuss the dependence of the free energy of a protein on the electrostatic interactions of its charged residues. We investigate the chemical equilibrium between a large number of different protein conformations and the dependence on the pH value. The partition function is evaluated and the results are applied to explain abnormal titration curves of coupled residues. From the grand canonical partition function (the number of protons is not fixed) calculate the protonation degree for both sites and discuss them as a function of the interaction energy W.